I love to make all types of ornaments, especially with fabric. 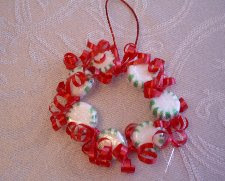 But this time I decided to make something special, a Candy Ornament that you can eat after the Holidays. If you choose to or not. Cut Red Metallic trim and Red Streamers. Start by twisting (2) Mints together with the end of Chenille Stem once. Add a Mint to one of the twisted Mints and go across and around once with Chenille Stem again. Repeat this process until the end of the Stem is latched on the first twist. With (3) Red Streamers tie on Red Metallic loop with the knot on the bottom to the Candy Wreath until secured. Tie on (3) Red Streamers to the rest of all (6) twisted areas. Use the scissors to curl the tied Streamers. Now you have a sweet holiday festive ornament, good enough to eat! Copyright © 2010 by Sarah Irby. All rights reserved.